Do I still prime below the waterline if I'm counting on the bottom cross planking to get wet and swell tight? Wouldn't that defeat the purpose of the primer? If so, will any marine primer do? -Maybe the designer has the answers for that? Looks like the boat will get pretty wet from inside as well, one review mentioned a copper bailer aft. I'd stick with the same family of seam compound/primer/thinner/paint. You might ask around local to see which Interlux bottom paint works best for your waters. 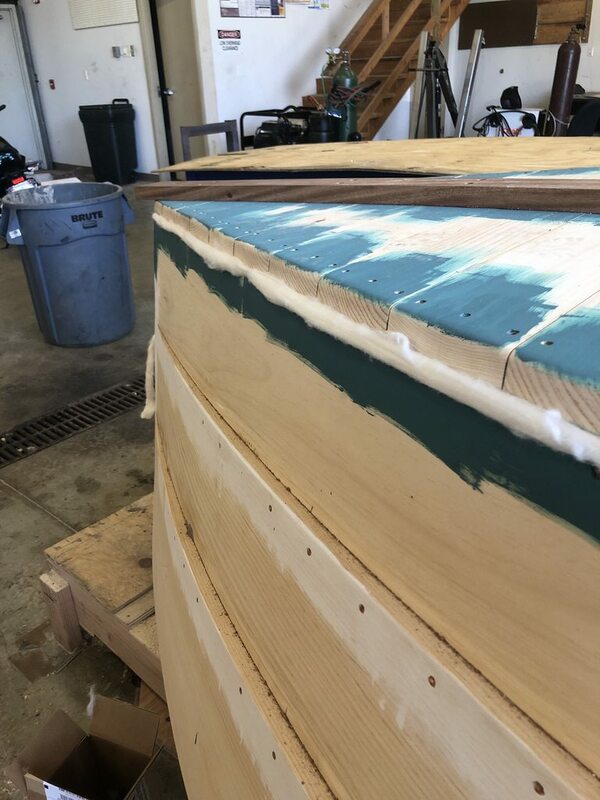 From Interlux: PRIMING for seam compound. 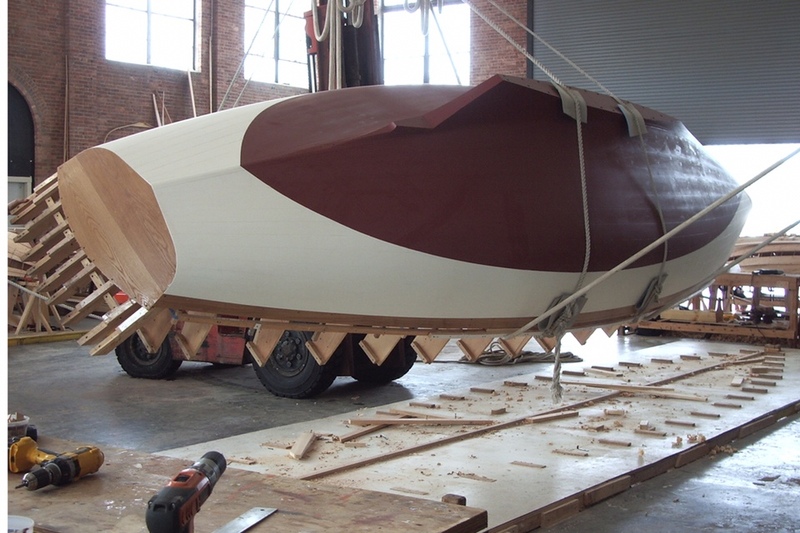 Thin first coat of Interlux antifouling bottom paint of choice 10-15% by volume. Allow to dry overnight before proceeding with Seam Compound Brown. Last edited by signalcharlie; 03-19-2019 at 07:54 PM. 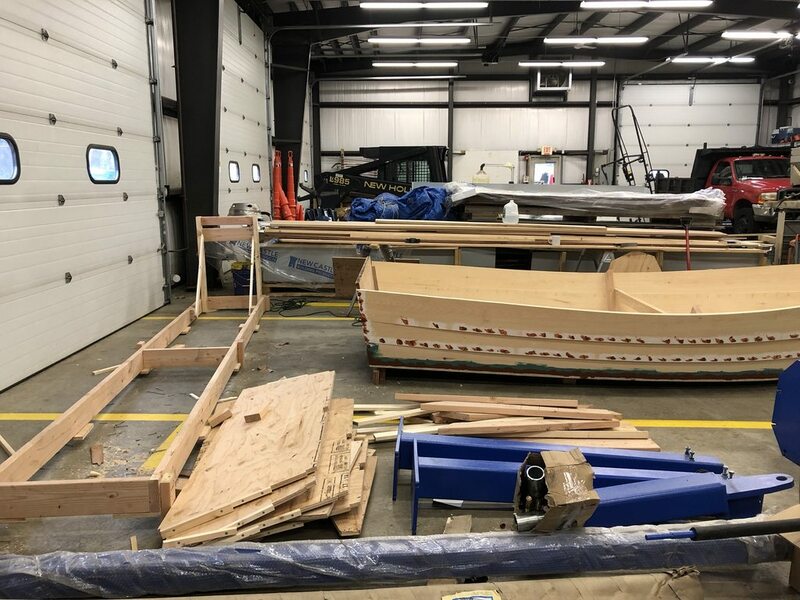 I'm about to start building a 16' boat in a 18x12 shed with no insulation. Mockup says it'll fit...but you did the right thing borrowing a giant shop! 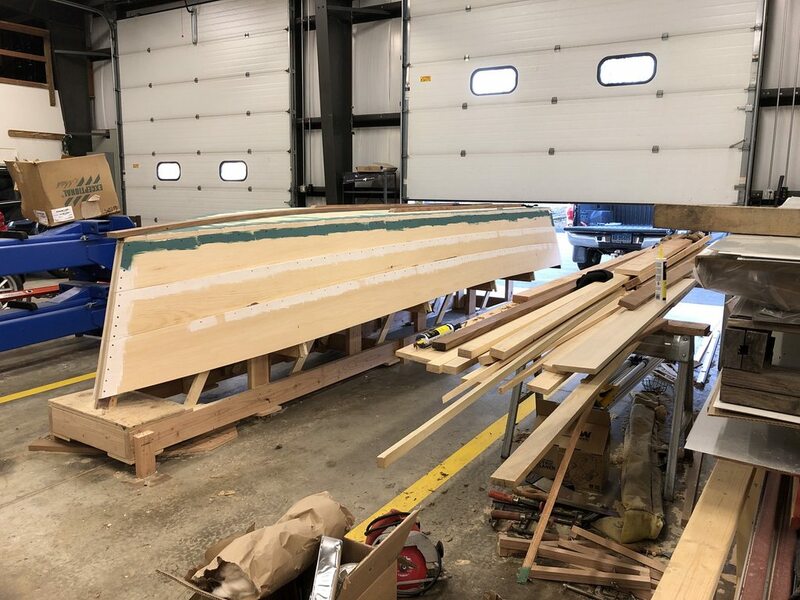 I think I read that we needed to add 4 feet to length and beam to get dimensions for a space for boat building. 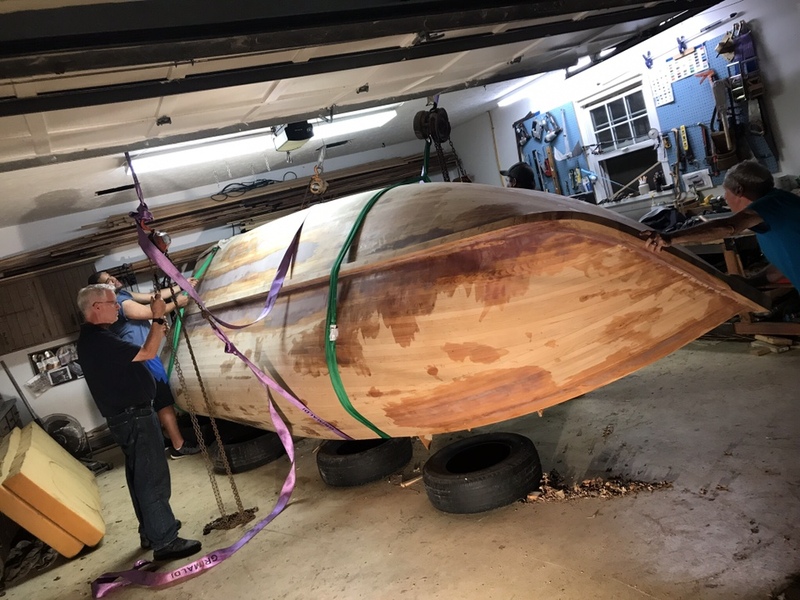 We cheated a bit with BARBASHELA by putting the strongback on wheels, parking her diagonally and poking the nose of the boat out of the shed periodically. Our "Carriage House" is 16x20, she's 21 feet. The Penobscot 14 fit in there also. Once she was off the restoration strongback she rode around on furniture dollies. Our other secret weapon was that we live in Florida, so heat is usually not an issue. 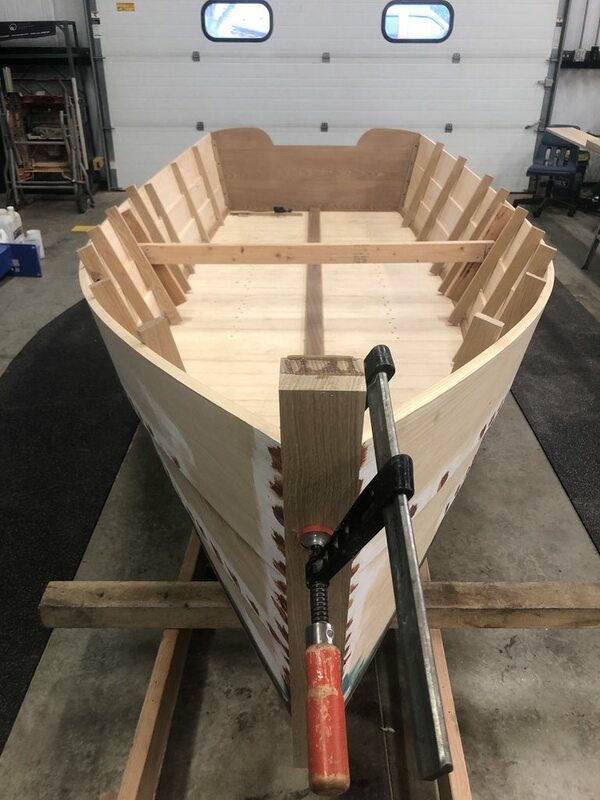 In the Summer we can steam bend boat bits right in the front yard! 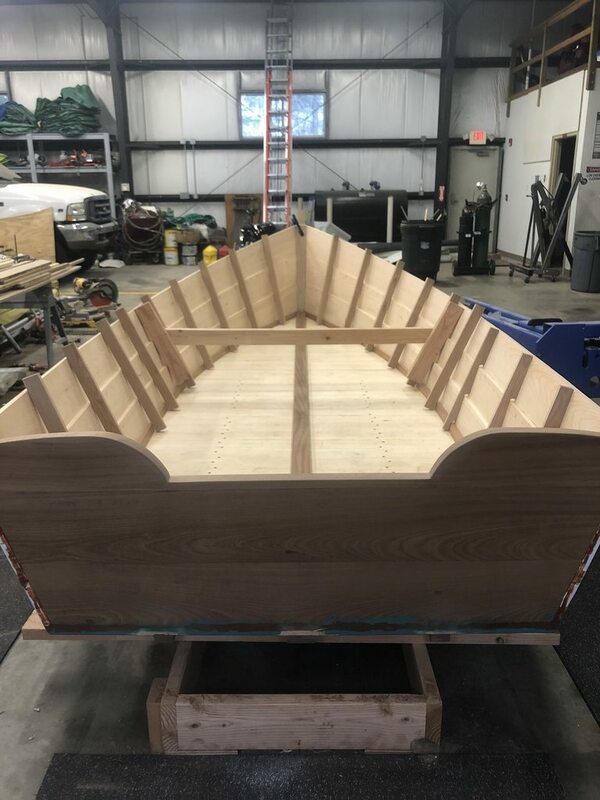 Hey all, we are about ready to flip the hull! Another big milestone for us. - Does anybody have recommendations on flipping the hull? It's going to be quite heavy and unruly. Is pure manpower the way to do it? 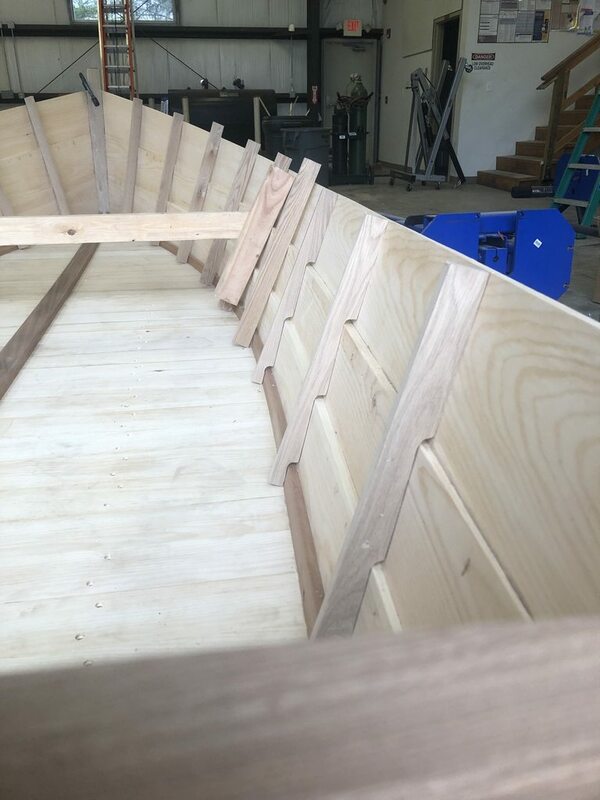 - The bottom planking is filled, but I dont think I want to sand the filler until the boat is flipped. I'm worried about saw dust getting in between the planks and affecting the way it swells. Is this a viable concern or just overthinking it? 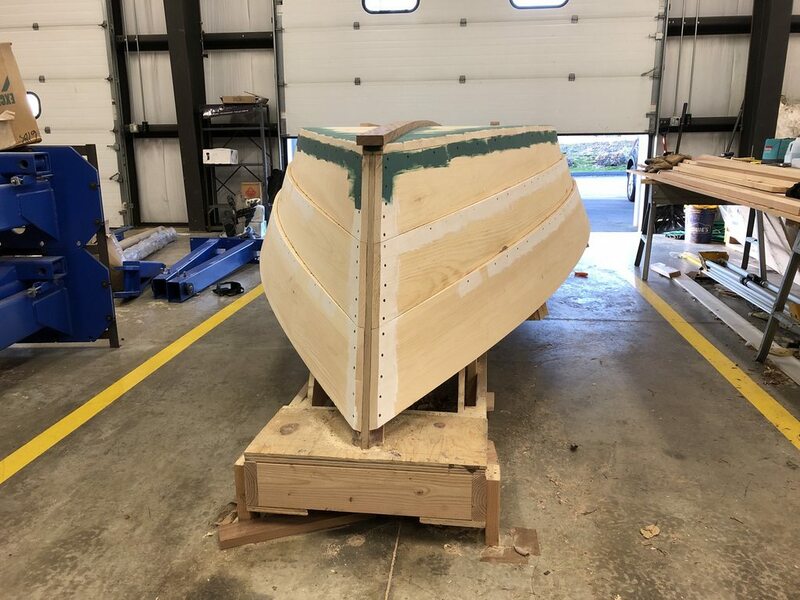 The bottom will be painted when the boat is upright for this reason. - I might go ahead and prime the top sides but the waterline has not been marked yet. 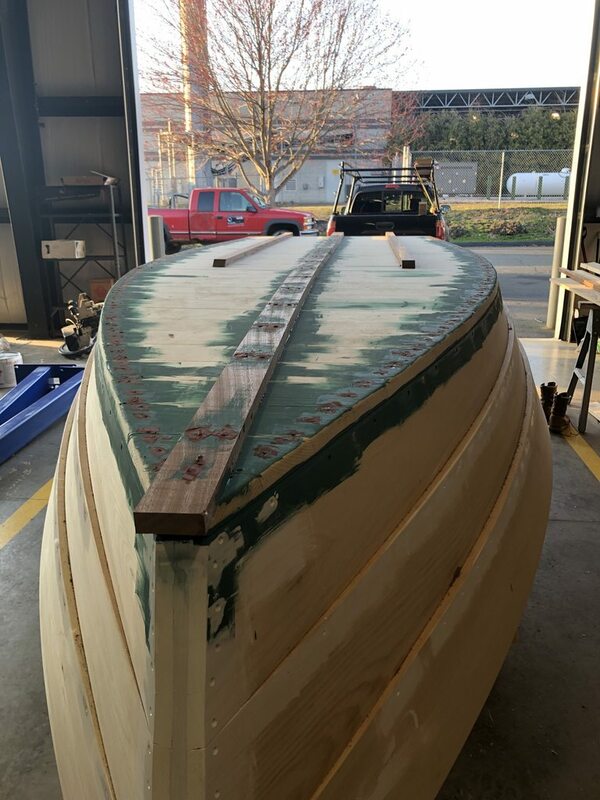 Is primer under the bottom paint okay, as well as under the gunwales? I guess this question also applies to varnishing the transom, I'd like paint to overlap the varnish instead of the other way around. 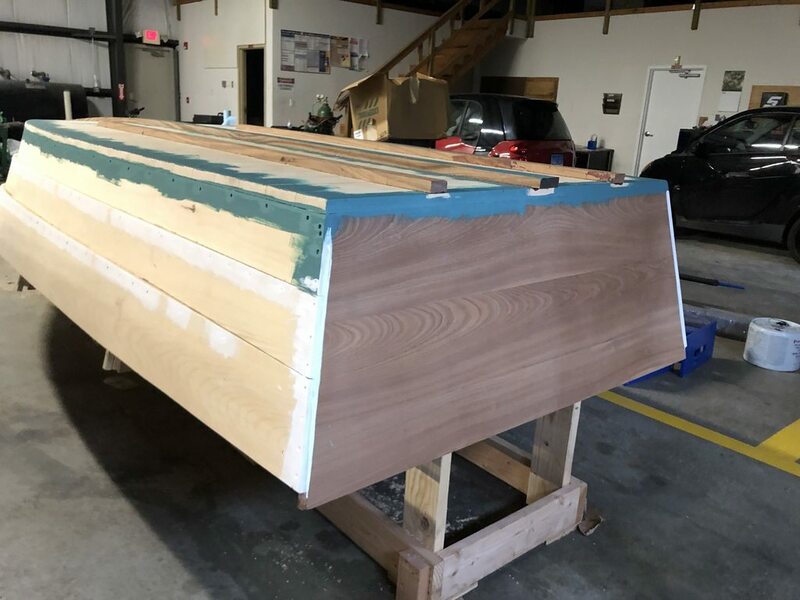 Can we varnish the transom and apply bottom paint over the varnish? Many questions, but I'd rather do it right the first time than do it twice! 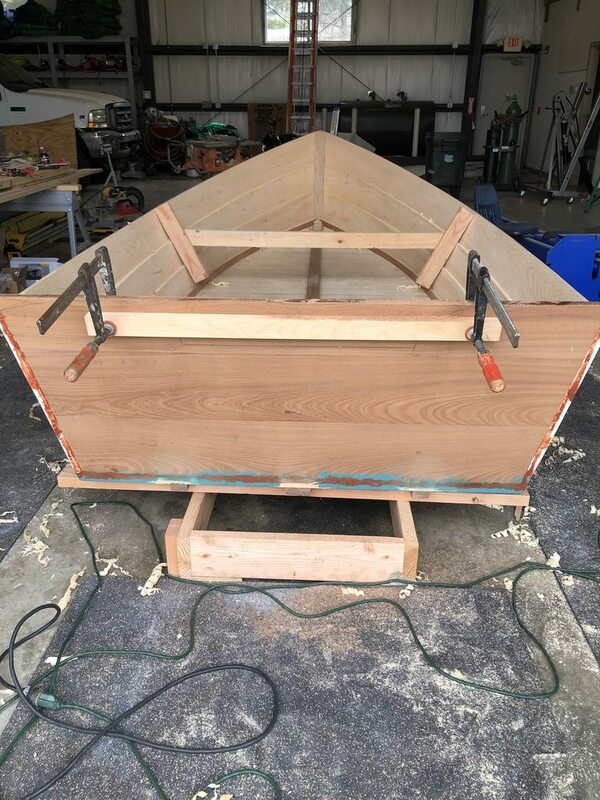 So the boat is flipped, transom is cut out, stem is laminated, and frames are starting to go in. It's been a pleasure thus far. The molds that took so long to build got broken back down so quick! Now these are actually fun! 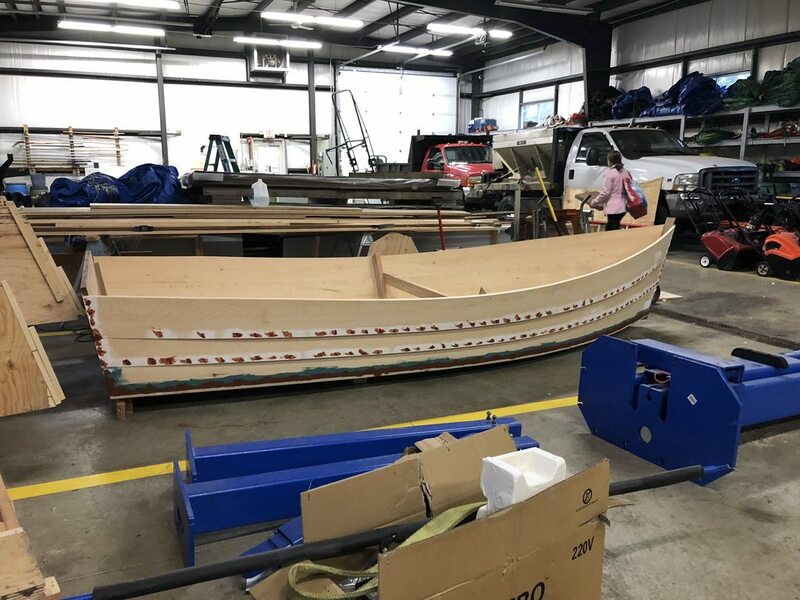 Its starting to look like a traditional boat! Looking good! 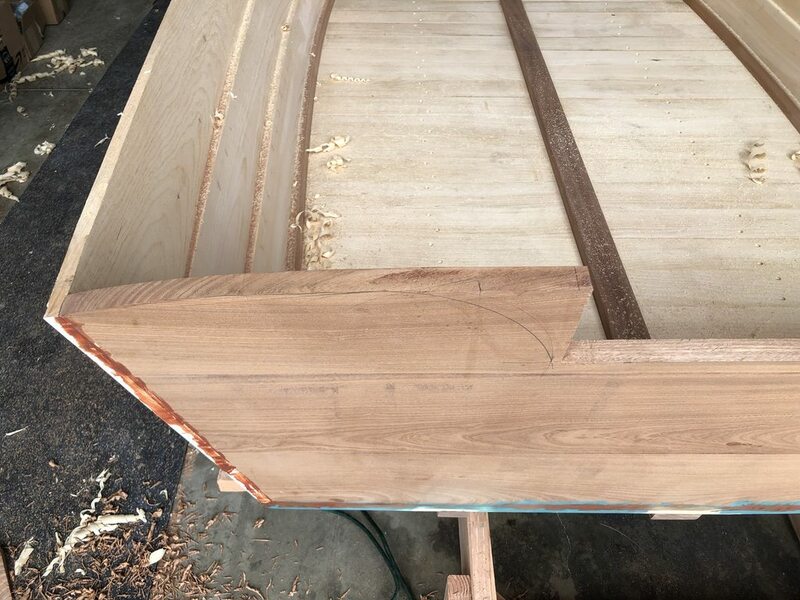 Love the transom, pretty stuff!